Pies...for BREAKFAST? That's right! Full of goodness to fuel your body too! I wanted to share this recipe with you guys as a SNEAK PEEK into my Simply Sugar Free Cookbook!!! Pre-sale LAUNCHING is happening next week! I wanted to share this delicious recipe with you! I made a ton of these in one sitting, and froze them! (You know I'm all about making life simple, and meal prepping breakfast is at the top of my list). My family will actually eat them frozen, let them thaw for a few minutes, or just pop them in the microwave for a quick second! They are packed full of nutrition! A great way to start your day, or even a great afternoon snack for the kiddos! Also, let's make sure you are on my pre-order list!! Sign up below, and you will automatically be sent a fun Fall recipe, plus be notified next week when my book is open to order! NOT only that, but my book sponsor, Swanson Vitamins will be giving one person on my list FREE $50 to spend on their website! Sugar Free Pecan Pie for the Whole Family! #1 I would get pregnant and be craving EVERYTHING (well I'm still working on conquering all those cravings). And #2, I was scared of the holidays! You know, the time when you are surrounded by family, and lots and lots of food. And at our family gatherings there's not only lots of food, but even more desserts! So this year, I took matters into my own hands! I decided that if I wanted to SUCCEED at staying sugar free, then I needed to make my own yummy, sugar free desserts for the whole family! When you set goals for yourself, you have to plan in advance to succeed. If you go with the flow and leave it up to others, it's much easier to fall into the normal, and not be successful at your goals! All it takes is a little extra thought, work, and determination to succeed your goals! Whether that's eating no sugar, limiting yourself on something, or continuing to work out while on vacation! This Thanksgiving I made a Sugar Free Pecan Pie for the whole family! Along with one of my other favorite holiday dessert recipes! The pecan pie was a huge hit! Actually I was super sad I only got one small slice of it. Then after waking up from my nap, the entire thing was gone. The pie is super easy to make and so tasty! Take a look at the recipe, and make plans to have a successful holiday season by bringing your favorite, sugar free pie to all of the upcoming gatherings you plan to attend! Hi All.... I am so close to being out of my first trimester, and I am praying that will mean that I will be back to my normal self. The self that is productive, that enjoys staying up late working my business, and blogging. But these days, when nighttime comes and my Little Z goes to bed, all I want to do is lay on the couch and go to bed early. Oh and take plenty of baths! That is what helps when I'm feeling sick. But soon, very soon I will be in trimester #2, and let's just hope that with that comes more energy and feeling better! Say Hello to Baby Suell #2! This pregnancy is already off to a great start. I am doing the #HolidaySweat Challenge with Run to the Finish & Fit Approach (you can join in the fun still!) Get details HERE! And I have set a Goal of clocking 600+ minutes of workout activities per week! The reason for this goal, and the reason for me being a part of this challenge even while pregnant, is because I want to stay healthy and fit during this pregnancy! Despite to normal thought of I can do and eat whatever I want while pregnant, I'm hoping not to gain 70-75 lbs again (like I did in my first pregnancy). I want to stay fit. I want to keep my muscles. I want to have a healthy pregnancy! That's why I've decided to add weights into my workout routine! Now on a normal basis I do workouts with resistance bands during my Fit4Mom Stroller Strides workouts! It's awesome and has helped me tone my muscles so much! But I feel like I'm at a place where I want more. That may seem weird to some since I'm pregnant, but of course I will be careful, but I know my body. I will listen to it and do things that are safe. My plan is to start including a dumbbell workout at home, about 2 days a week. I have a 25lb dumbbell, and here's some of the exercises I plan to do on a normal basis. Along with the dumbbell workouts, I want to get back in to doing my favorite full body kettle bell workout. I have a small kettle bell that I got two Octobers ago for my birthday, and an all time favorite youtube kettle bell workout that I love to do! It's just enough challenge and goodness for the entire body! If you have a kettle bell I highly suggest trying out this workout! You will not regret it, and your muscles will thank you! So there you have it! I'm upping my game, even with a baby in my belly! But hey....I've got to up my game, because pushing a double stroller is NO JOKE! I've been pushing my sister's kiddos around while we run/walk, and oh my goodness! Momma's who use a double stroller every day have some strength!! I'm linking up to the Fit Dish Link Up with Jill Conyers & The Fit Switch! Healthy Cookies & A Hemp Heart Giveaway! It's the weekend, so why not enjoy some HEALTHY COOKIES topped with Manitoba Hemp Hearts! Seriously, this recipe makes everyone in my home happy! Even those who still willingly consume sugar on a regular basis! And for me, being sugar free for almost a year, when I make something like this it is such a treat for me! Made with lots of good ingredients like almond flour, coconut oil, and sweetened with honey! Plus with the added hemp hearts on top, you are adding extra protein that is plant based, plus omegas which are amazing for everyone! SHARE THIS RECIPE with your friends, and ENTER TO WIN your own pack of HEMP HEARTS from Manitoba Harvest below. You can add hemp hearts to just about anything for their added goodness and nutty flavor! I use them on salads, in my smoothies, or anything sweet like yogurt or these cookies! ENTER MY OTHER GIVEAWAY for the Fit Body Bakery!!! Go here! DISCLAIMER: This post was sponsored by Manitoba Harvest & FitApproach, but all opinions are my own. I told y'all last week that Breakfast has been on my mind, and I'm serious! Around my house, we love BRINNER! I could probably make Brinner every day, especially when it's easy to make, plus packed with goodness, sugar free, and healthy for you. But seriously...what kind of breakfast is that!?!? (Other than eggs and meat). Well I will tell you my newest found secret! It's incredible and tasty! And it's from Fit Body Bakery! That company name just screams goodness right!! We had friends over for dinner recently and decided on breakfast! Well with my first trimester kicking me in the tale, I didn't feel like cooking at all! I was so thankful to have these POWER UP PANCAKES on hand! They are Gluten Free, Sugar Free (sweetened with Stevia), a full of protein and goodness. So not only were they easy to make, they were good for you. Then to top it off, they were so delicious, everyone loved them! They had a huge amount of flavor to them! I was timid to see if the men would think they tasted weird since they were "healthy" pancakes, but they had only great things to say about them! Even my son was grubbing on these! And I don't ever give him regular pancakes, just the ones I've made with protein powder and or bananas. I try not to fill him up with carbs. But with these having so much nutritional value in them, I gave him one and he loved it! I think he ate the leftovers the following days too! So here's the great thing about me being pregnant right now and LOVING FOOD!... Is that I like to GIVEAWAY FOOD! So who wants to WIN a mix from Fit Body Bakery!?!? Plus, they don't just have pancakes, but also some yummy muffin mix too. (I added blueberries to mine!) Plus some cookie and brownie mixes that I have heard from other Sweat Pink Ambassadors that they are to die for! So if you win, you get to choose which you want! Here's a little something you need to know about Fit Bakery! Fit Body Bakery® is dedicated to helping people meet their health and fitness goals in delicious ways. Our mixes are packed with 6g+ protein per serving to satisfy hunger and keep you going all day long. With about half the sugar as conventional baking mixes and recipes, our treats still satisfy your sweet tooth with unrefined coconut sugar and stevia. Made with 100% gluten free whole grains our mixes have no preservatives or artificial ingredients. Disclaimer: This products reviewed in this post were given to me by Fit Body Bakery & Fit Approach through my Sweat Pink Ambassadorship. All opinions are my own! Well one thing I just can't get enough of during these first week's of pregnancy......BREAKFAST! That's right, I've got Breakfast on my mind! It doesn't matter what it is, biscuits, crepes, pig in the blankets, eggs, cereal, or waffles. I love it all! So this week I'm going to be featuring two great breakfast tips/recipes, plus I've got a little GIVEAWAY for you!! I'm still a sucker for any breakfast food with blueberries in it! Like my yummy Sugar Free Blueberry Waffles!!! Get the original recipe here! Now these have been a go-to favorite for my family since I went fully sugar free in January, but this past week I decided to add something different to the recipe to make it even better! Through being a Sweat Pink Ambassador with Fit Approach, I was sent two bottles of yummy Mighty Nut powdered peanut butter! In the past I've mostly enjoyed using powdered peanut butter in my smoothies, but sadly since becoming pregnant I have not had a smoothie. (I usually have at least one a day as a meal replacement). So I had to get creative! First I enjoyed some of my Flax & Chia Flavored Might Nut sprinkled over cereal. You see since I don't eat sugar, the cereal I eat is super bland. Usually I sprinkle cinnamon over it which adds a natural sweetness and good flavor. But I loved the change and getting a little peanut butter taste to it as well! But, the thing I am really loving, is adding a couple of tablespoons of the Might Nut Peanut Butter (any flavor would be amazing) to my sugar free waffle recipe batter! It adds so much extra flavor to the waffles. Plus you are getting 5-6 extra grams of protein added to your meal!! So who is ready to WIN a bottle of their choice of Mighty Nut!?!? It comes in these great flavors, and the winner gets to choose which they want! What recipe would you add your Mighty Nut to? Disclaimer: This is a sponsored post from Mighty Nut & Fit Approach. I am thankful for all brands that partner with me as a Sweat Pink Ambassador, but all opinions are my own. Well here we go....it's the start of a new journey....the start of my Fit Pregnancy. Well here we go....it's the start of a new journey....the start of my Fit Pregnancy. I'm about 6 weeks pregnant with Baby #2, and I am determined for this to be a fit pregnancy. I am determined to continue my healthy lifestyle....and that includes the way I eat....not just working out! I'm about 6 weeks pregnant with Baby #2, and I am determined for this to be a fit pregnancy. I am determined to continue my healthy lifestyle....and that includes the way I eat....not just working out! I shared last week how I planned to stay Sugar Free throughout my pregnancy, and even past the end of the year. (Since my original commitment was through the year 2015). I also shared a photo of what I looked like towards the end of my previous pregnancy. I was 70-75lbs heavier, and mostly just did Yoga and walked. This pregnancy though, I am determined for it to be DIFFERENT! I would love to look similar to the way I do in this photo, just with a belly! To some this may be unrealistic, but I believe if I continue to workout and take care of myself, and eat good food, then it can happen! And it will be perfectly healthy as well! [bctt tweet="Try these tips to have a FIT PREGNANCY with @BrittanySuell #LeaveYourLegacy #Fitpregnancy #Fortwofitness"] Here are a few ways I plan to have a FIT PREGNANCY! 1) EAT WELL! Now this is easier said than done....especially since last night I devoured a bag of Doritos, (mostly by myself). But I want be honest here! Especially during this first trimester, that is going to be incredibly difficult, but I will keep trying! Yoga ALL THE TIME! During this pregnancy! Last time I did Yoga 1-2 times a week and I know it helped make my pregnancy and labor go great! (Read my birth story here) This time it will be even easier since I teach 4-5 classes per week. I want to stay consistent at my Fit4Mom Classes, even through being tired. I want to stay motivated and active! This may sound crazy, but I want to KEEP RUNNING throughout my pregnancy. Last time I stopped because I got so tired, and late in my pregnancy I regretted it. I felt like I couldn't start running again when I hadn't been doing it, and I missed running. I missed getting my sweat on in general! So this time, I'm going to keep running. Even just short distances! I will say that I'm starting on the right foot though. I will be running a half marathon this Sunday, and then another on November 15th! Which will put me into the 2nd trimester, (or close at least), which is usually when energy comes back anyways, so I should be able to just keep going! It is important to me to stay healthy! Although it does seem freeing to use the excuse of being pregnant to eat any and everything I want....and sometimes I may do that. (just not with sugar). But for the most part, I want to eat healthy and stay active, and I know it will pay off! What have your pregnancies been like? What was the one thing that made it hardest to stay healthy during your pregnancy? Wow....it's been a little over a week since I found out I was pregnant! Anyways I will say that even just this past week has been super hard on me! I have had zero energy, and have felt....like crap! I have had no desire to cook food, and a huge desire just to go out and grab fast food when I'm hungry. I have been good at eating fruit when I need a snack. Either that or saltine crackers. It keeps coming to mind for me though what my doctor said when I went to my 10 week appointment for my son Zander's pregnancy. My husband asked how important nutrition was at this time.....(we had several arguments over my lack of nutrition in the first trimester of that pregnancy), and the doctor said...."Right now, it's really just about surviving and eating what she can." Ahhhh.....such a sigh of relief. So I am trying to keep that in mind during this time as well....although it is super hard. I will say I have truly been craving and wanting cereal! Now, if you don't remember, back in January 2015, I made the commitment to go SUGAR FREE!! That's right, I gave up sugar all together! In drinks, in foods, period. I was done with sugar. And it has been a great year so far! I have loved this lifestyle of not worrying about eating sugar and having that guilty feeling after a long weekend. I have even had fun in the kitchen trying out new recipes. Right now though, the last thing I want to do is be in the kitchen. And when I'm craving cereal, and EVERY SINGLE CEREAL has sugar in it, I won't lie, the Regrets of a Pregnant Woman start coming out. Like did I really commit to that? Surely all my followers would understand!? But no, I am staying committed! Even through these pregnancy cravings! I have loved this sugar free lifestyle and I knew if I got pregnant it would be hard. BUT, I want this to continue being my life even after 2015. Many have asked if I will stay sugar free after the year is up. (My original commitment was the year 2015). And my answer is YES I will stay sugar free! For now though, I will keep begging my husband to cook for me while I lay on the couch, or take me out when he just can't do it. And I will keep working hard at staying fit as well! I want this pregnancy to be a fit one! And I know if I stay away from cereal and all the other sugar cravings, I will not gain 70lbs like I did in my first pregnancy! I'll be sharing more on my desire to have a fit pregnancy next week, but for now, I will say that it has been so helpful to have the #BOSUStrong Challenge pushing me to be committed and stay fit! I love challenges with Fit Approach! They are inspiring and fun! Plus my little man loves working out on the BOSU with me too! Plus if you include valslides, or paper plates under your feet along with a Bosu, you are getting an incredible workout!! That's what I did today for some side lunges. I put valslides under my feet and slid them out and back in for lunges! It was super hard!!! How I Celebrated My 28th Birthday! Yesterday I told y'all to come back today to really celebrate my birthday! So thank you all who have come back!!! So yes, I had an amazing night! My husband was awesome and planned a perfect night with friends! We used a rental home where he cooked fajitas for us, with some amazing salsa and guac (two of my faves). We hung out, chatted, then played a great game! Some of my closest people were there, making it just as special and showering me with gifts! A great way to celebrate my 28th BIRTHDAY! But.....when my friends came, they didn't know that I actually had a surprise for them as well! It was the best part of the night, and the part that I had been looking forward to the most! I was done opening presents and my husband pronounced that he had one more gift for me. He made it clear that it was a big deal and super special. He had his camera ready and all of my friends were skeptical and on edge. He even asked them all to move to one side of the table so he could video just me and my response. Then, when the time came, he handed me a jewelry box.....I opened it, and you can see the rest here! And as my official Yogi Announcement, here it is! That's right! I'm entering the world of pregnancy again! Whew! I'm super excited and also still a little in shock! Can't believe next year at this time I will have 2 children! hahaha I have already begun to feel the brunt of the first trimester! I have been extremely tired and feel the urgency to eat like all day long! It hasn't been easy so far, but I'm praying for more energy and motivation to get things done. Especially since I am a blogger and business owner, I've got to find the motivation somewhere to be able to get it all done! Showing my #BOSUStrong on my 28th Birthday! That's right!!! It's my 28th Birthday!!! I enjoyed a relaxing, super lazy weekend that was much needed. Then today breakfast with a few friends and lots of babies, lunch with my son and husband, then after teaching Yoga tonight I'll be enjoying an evening with some of my favorite friends! So instead of having a super celebration for my birthday today, I'm going to ask you to come back here tomorrow! Because we will be having a celebration that you will NOT want to miss!!!! For today though, as I reflect on 28 years of life. The ups and downs, the tears and laughs, the adventures and vacations, the joy of my life, I am thankful for some many things! I am of course thankful for the people in my life, but today, when I think about ME, I am thankful for the life I have chosen to live. I made the choice to live a healthy and fit life. I have made the choice live the #LiveYourLegacy Lifestyle! I love that I went after my dreams of being a fitness instructor and that I am doing it now! I love that I spend my days getting to help and inspire others to live their best life by choosing a healthy and active lifestyle! I love that at 28 years old, after having a baby, that I feel the healthiest, fittest, and strongest that I have ever felt in my life! I never say I can't do something, I'm always willing to at least try. I do have cravings for unhealthy things sometimes, but I choose the healthiest version! I love to sweat with my favorite people! I am inspired to change the world! I want everyone to have the desire to be their healthiest, their strongest, and to Leave their LEGACY! I love to encourage others to get out of their comfort zone and try new things. I have a desire to live a life that matters! I am proud of the risks I have taken in life! I hope to motivate YOU to live your healthiest, fittest, and strongest life....starting NOW! So as I celebrate my 28th birthday, I am proud of my strength! I am confident in who I have chosen to become, and happy with the person that I am! I am BOSU STRONG! Get your #BOSUSTrong on with us this week for the last week of the challenge! The winner of my NATIONAL COFFEE DAY TANK is Courtney Mentzel! That's right...it's NATIONAL COFFEE DAY! So you know what I'll be doing...all day long! Let me tell you why I love coffee! All things Fall, Winter, and Christmas! 3) I love drinking coffee with other people! Coffee takes away the pressure to always hang out with people around meal times! It gives you something to do while chatting with friends, but not having to stuff your face while doing so! Even the idea of being at a coffee shop alone, but knowing others are drinking it too....makes you feel good! 4) I love the taste! "All I need is a little bit of coffee, and a whole lot of Jesus"
"I don't need anymore coffee....said no one ever"
"This house runs on love, laughter, and lots of strong coffee." So while we are on the subject of Coffee shirts, how about a GIVEAWAY!!! Want to WIN this "But First Coffee" shirt??? LEAVE A COMMENT TELLING ME WHY YOU LOVE COFFEE TO BE ENTERED TO WIN! Visit my Instagram for more chances to WIN! Also, check out all the places you can get FREE COFFEE today! Here's a list! Yep I admit it....life has been crazy the past couple of weeks! I literally unpacked my suitcase a week and a half after I got home from vacation. I've been busy spending time with my son and enjoying some much needed play dates after being gone for almost two weeks. I feel like I can barely keep up with cleaning my house, all in the midst of teaching Yoga & Fit4Mom classes and hosting Freezer Meal Workshops. There are several things that help me through crazy, high-paced, or even stressful times. When doing Balancing Yoga Poses, you have to focus! It takes not only strength, but mental focus. So when I practice balancing poses, my thoughts go away from the craziness of life, and I am forced to focus on holding the pose, and keeping a steady breath. This brings relief to a crazy life, and allows me to clear my mind of all that it has been bogged down with. Yoga Balancing Poses truly are a powerful tool when life is crazy. What are Pluggz?? Pluggz are shoes (super cute shoes) that have grounding techniques that connect you to the earth and enable an electrical connection and harmony that our body needs. Our body is lacking in electrons due to the separation we get from most buildings and footwear. Pluggz have a connection agent that keep that contact for us! "High-tech materials tend to cause us to accumulate an excess positive charge, or stated another way, a deficiency of electrons. Grounding eliminates this excess positive charge and brings us back to our natural state of being in harmony with the earth. Excess positive charge adversely affects various physiological processes. Most people can feel the difference that grounding makes...One can also get grounded by going barefoot on the earth...."
3) Have a good book with me always! Yep I just started reading this book. And as a matter of fact, I just adopted this concept of staying balanced. I think taking time to read a book in your spare time versus getting lost in your phone or other technology can definitely keep us balanced. It quiets our mind, and in this case is a great way for self-development and growth. This book is all about taking advantage of our "Fringe" hours, or spare hours throughout the day. So that's what I am doing by keeping a book on hand with me. Now I just have to fight the urge to be on my phone, and instead choose to pick up the book when I have free time. This concept has been a life saver over the past few months. As you may know I host local and long distance Freezer Meal Workshops! You can get more info on that HERE. Having healthy meals prepped ahead of time and ready to toss in the crockpot in the morning or at lunch is so handy! Plus when it's time to eat my home smells incredible! And all the meals are amazing! Especially my latest menu of soups and stews! (I'm so ready for the Fall) You can order an On-the-Go Workshop here and get the recipes and all you need to make these yummy soups! Oh, but be sure you REMEMBER TO PLUG IN THE CROCKPOT! Yep, that happened yesterday...needless to say, we went out for dinner! Whatever you do, just keep going! Give yourself a high-five, take a couple of minutes to breathe, and remember why you do what you do, and soon enough, the craziness will chill some! JUST KEEP GOING! You can do it! Surround yourself with people that will push and encourage you to keep going when life gets hard! Join a #FitFam, and be encouraged by them, but just keep going! Join the #BOSUStrong Challenge this week! Show us how you are staying balanced, and maybe WIN your own BOSU! I'm linking up to the #FridayFive Linkup with Mar on the Run, and #FitnessFriday with Jill Conyers! How to Use a Yoga Detox for the Body After Summer Indulgences! Well, summer is coming to an end. And naturally we tend to eat more in the summer. Why....because our bodies know that we need to store fat and extra warmth for the upcoming cold season. So it's not necessarily a bad thing, but it's definitely a real thing that happens! So today, my lovely, Yogi friend Lora Hogan, from Florida is going to share with us how to use a Yoga Detox to detoxify the body after summer indulgences! Lora is passionate about life, joyful, and all about spreading the love! Lora has a passion for communication and expression which naturally translates to teaching, writing, marketing and public relations. For more of her inspiration and yoga posts, check out her blog or follow her on Instagram! Ice cream, brownies, beer, wine, burgers, hot dogs, chips oh my! This last weekend of summer leads to enjoying the sun, the family, the outdoors and ALL THE BBQ FOODS. MMMM. Here's my go-to three-day weekend evening routine. Even if you only have five minutes to yourself. Even if you practice in a sleeping bag, at a camp site, or on a hotel room bed, these poses can help you wake up feeling JUUUUUST a teensy bit better! What, you ask, should you do? Why, practice supine twists of course! Reclined twists are great for aiding in digestion. The passive and restorative nature also helps to calm the nervous system--which can be great for when you've been go go going with friends and family! They also help to relieve discomfort in the back from sitting (car trip or long periods of time in lawn chairs anyone?). Drinkers take note: twists are also detoxifying for the kidneys and liver! Come reclined on the ground, a mat, a towel, or even your bed! Plant your feet underneath your knees and bring your knees hip width apart. Press into the feet to gently lift the back and buttock up off the mat. Scooch your back over to the right, this will help to relieve pressure on the low-back in the posture. From here, drop both knees over to the left. Bring your arms to a t-shape or make goal post arms. Gaze can be straight up towards the ceiling or, if there is the neck flexibility, you can turn your gaze over your right arm. Stay for at least five deep breaths. Come back to center. Bring the pelvis back to neutral. Pause here for a moment and notice the difference between sides. Then, press into the feet, lift up and move your buttock etc. over to the right this time. From here, then drop both knees over to the left (shown below). Again, you can bring both arms to a t-shape or goal post arms. If you'd like to go deeper into the pose, it may feel good to take that right hand and help to drop the knees further over to the right! (Only if that feels good!) Once more your gaze can stay straight up at the ceiling (or sky outside), or if the neck allows, you may wish to turn your gaze over that left shoulder. Stay here for at least five breaths or until this side feels even with the first. If you feel that your first side was tighter, you may want to go back and hold on that side until you feel a sense of equilibrium. Do you make time to practice twists after a busy time? Do you remember to work-out at all? What's your go-to plan? Let me know in the comments below! I'm linking up to Fitness Friday with Jill Conyers! How I #LiveInPrana Even on Vacation! Yep, I made it back from vacation! We had a blast! Let me just say it's super fun to stay kind of local (about 4 hours from our home) and explore the state/area that you live in for all it's worth! We stayed about 50minutes from two major cities, Austin & San Antonio, Texas, and we got to enjoy those, plus so many more throughout our week. One things for sure, my Prana clothes got me through the entire week! 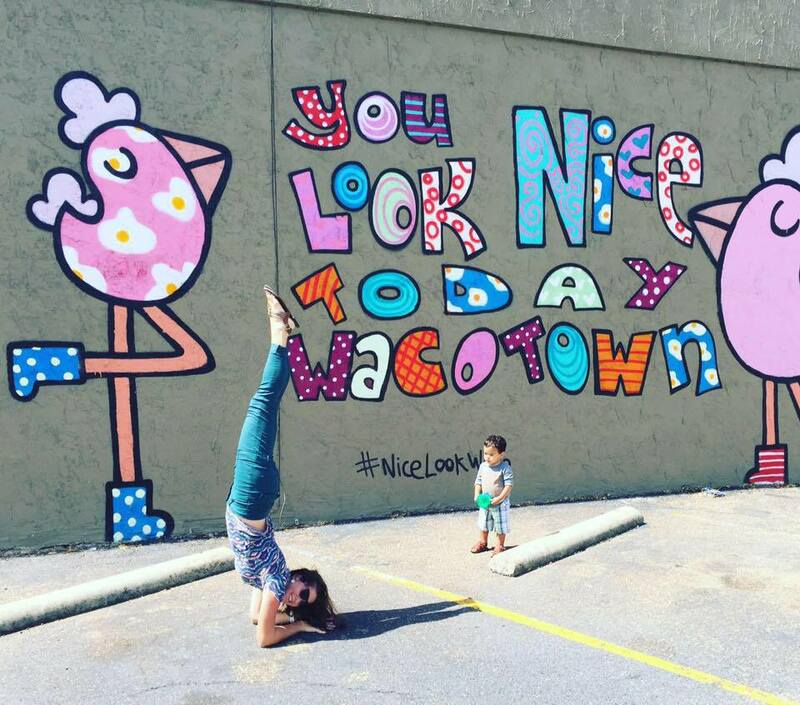 We started our vacation by spending a night in Waco, Texas. We got to see the Fixer Upper's store (from HGTV), plus explore some fun around the city. And let me just say these Meme pants are my absolute favorite! I'll be honest, when I first got these I wasn't sure about the Cargo pockets on the side, but they are my fave! They add a uniqueness to the skinny jean! The fabric that these pants are made out of are incredible, and they are flexible and easy to move in! I can easily go from dressed up, to cute and casual, to all out hiking or handstanding all in the same pants! Once we got to Austin, I had to take advantage of the FREE YOGA DAY! So I grabbed my husband for a Vinyasa Flow Class that ended up being the HOTTEST Hot Yoga Class I have ever taken, at Black Swan Yoga Westlake. Which was a great studio with awesome instructors! I enjoyed the class a ton. I also got lots of laughs seeing my husband slip and slide, and be drenched in sweat. (He's not a Yogi, so this was a true challenge for him). I on the other hand was decked out in Prana gear, and ready to sweat! I wore my favorite outfit from their Spring collection! The Ambrosia Tank, which was perfect for hot Yoga. It has super cute cutouts in it, which made it totally breathable. Plus the also band around the waste keeps it in place while also allowing for a flowy top. The Roxanne Capri in the orange pixel print. These are seriously some of my favorite leggings! I get so many compliments on them, and they are super flexible for all sorts of workouts. I also used my Prana Yoga Mat which was a great companion for the sweat fest class we attended! Although myself and my mat were both drenched in sweat, I had no fear of slipping and hurting myself as I held poses. You may also notice my Yoga Mat Rap, it's Prana too! 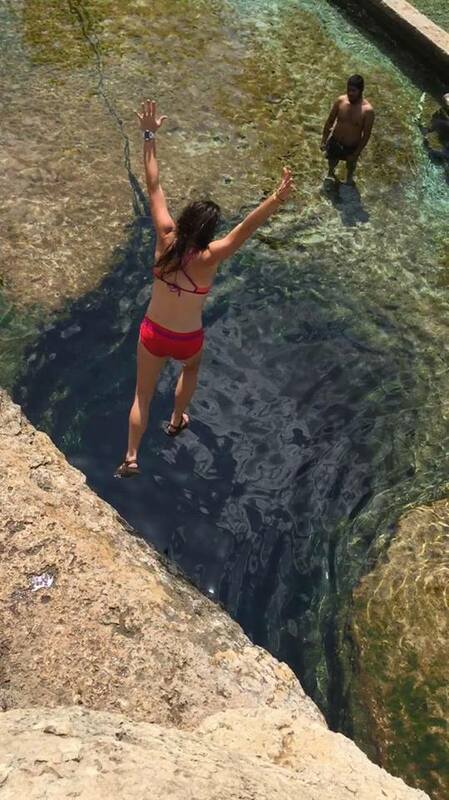 We also took some adventures while we were in the area, and found 2 amazing natural springs that are including in the Top 10 [Natural] Swimming Holes in Texas. The one pictured above is Jacob's Well! It's not only a natural spring that you can hike around and swim in, but there's also a 30 ft. whole in the spring that you can jump into! My amazing Prana swimsuit was incredible for this sort of adventure! Not only did I feel super cute, but the Tobago Bottoms which claim to be "a secure fit [that] will withstand heavy waves" measured up! While climbing up rocks to the top, and even jumping in the water I felt secure and these things stayed put! The same went for the Taala Top, when I jumped in I definitely expected to have to readjust my top before submerging from the water, but nope, to my surprise my top stayed in place! Then....one of my favorite moments of my week happened! I got to take an Aerial Silks Class at 4 Elements Austin. Wow was this a rush! Seriously such an invigorating experience. The challenge that you get when you do a Silks class is so fun! And felt so good to be able to achieve and hold some of these moves. And once again, my all time favorite Prana leggings got me through it! These are the Gabi Leggings are amazing. The seems create a flattering look, plus the Chakara Performance Fabric is different. It's more of a cotton feel vs. a spandex. I love them! They are so comfortable and super cute on! They are most definitely my go-to's! I really need to get them in the other color! We also played Top Golf, enjoyed a morning on the Tennis Court, and spent an entire day wine tasting at some amazing Texas Hill Country Wineries! We were so impressed by how much Texas had to offer! Then I finished the week by joining my mom for some early morning Yoga and a mid-morning run. Plus we got to enjoy some amazingly cool weather. The first that I have felt in Texas, but we could definitely tell that Fall is on the way, so I pulled out my Ergo Leggings which are super stylish, majorly athletic and a great fit legging from the new Prana Fall line. And I had to throw on my Ginger Top to stay comfortable in the cool weather! Prana is easily my favorite brand for all things in Life! They have it all...Comfort, Cuteness, and performance! That's How I #LiveInPrana even on vacation! What's your favorite Prana piece, whether you own any or not? This post is sponsored by Prana. All opinions are my own. I am thankful for all of the amazing companies that support Fit Approach and their ambassadors! @brittanysuell Leaving a Healthy & Active Lifestyle Legacy! This week starts an amazing 4-week challenge! Have fun, get fit, and show your strength with the #BOSUStrong Challenge! Put on by Bosu and Fit Approach! And you do not have to own a Bosu to participate in the #BOSUStrong Challenge! You can however WIN your very own Bosu just by participating! Each week 1 lucky winner will get their own BOSU! So join the fun and participate! All you have to do is post your #BOSUStrong pictures via your social media, tag @BOSU_Fitness & @FitApproach and use #BOSUStrong when you answer the daily prompts! Starting off TODAY! It's #MOUNTAINCLIMBMONDAY! Post a picture or video showing off your best Mountain Climber! And do it a little extra to add some strength!! You can even get creative, and show your best way to climb! Whether that's hiking, rock climbing, planking, the sky is the limit! Have fun with it and get STRONG! Here's prompts for the rest of the week too! When you buy a Bosu Balance Trainer enter the code “BOSUSWEATPINK15” to get the BOSU Total Body Basics & BOSU Core Basics DVDs free. HAVE YOU EVER WORKED OUT WITH A BOSU? ARE YOU JOINING THE CHALLENGE? Disclaimer: This post was sponsored by BOSU but all opinions expressed are my own. I truly appreciate all of the brands that support the Sweat Pink community. Since I'm on vacation this week, I've set up some awesome guest posts from some great bloggers for you! Be sure to follow me on Instagram to see how much fun I'm having, and how I made our vacations super active and healthy! Today, Lindsey Murray is joining us to share her Tips for Keeping Vegetables Fresh! Now let's admit, this can for sure be a struggle! And nothings worse than having the food that you just spent your hard earned money on ruined! Lindsey is the mom and blogger behind Healthy Food Fit Family. She loves traveling the world with her husband and two boys finding fun new ways of staying active as a family. Her current obsessions are pizza and wine. You can find more from Lindsey on her Instagram and Facebook Pages. I've been finding it so hard to keep vegetable fresh after I shop. Once I get everything home and put it away I swear I turn around and somethings soggy or moldy! Whats the deal?! Well I've done some trial and error and found that you can keep things fresher longer...with a little work before hand! Here are some tips to keeping them fresher, longer! 2. Lettuce and cucumber can be washed and wrapped in a paper towel. This will absorb any excess moisture that causes it to spoil. 4. Eggs should be kept on the lower shelves, never on the door (the door isnt as cold). Also, if you purchase eggs in styrofoam you should put them into a cardboard egg holder once you get home. Eggs tend to stick more to styrofoam which can cause them to break. 5. Fresh herbs can be wrapped lightly in paper towel and kept in a sealed zip lock bag. 6. Fruits: This could be another posit in itself so Ill just do a few. Bananas are for the counter (not next to anything else and should be separated) Apples I let sit in a sink of vinegar and water for 10 minutes to remove wax and dirt! 7. MY FAVORITE, most used tip: MUSHROOMS! I looove mushrooms and they are the first thing that seems to go bad in my fridge! This tip has lasted me a week now and theres no sign of them turning gross soon! I asked for a paper bag at the grocery store, cut off the top, placed the mushrooms inside and folded the top down ...THATS IT. Do you have any tips for keeping things fresh longer?